Atrial flutter is a cardiac arrhythmia characterized by atrial rates of 240-400 beats/min and some degree of atrioventricular (AV) node conduction block. For the most part, morbidity and mortality are due to complications of rate (eg, syncope and congestive heart failure [CHF]). See the image below. Anatomy of classic counterclockwise atrial flutter. 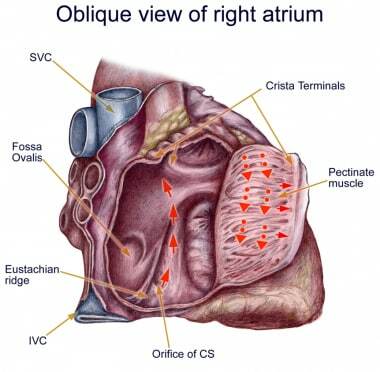 This image demonstrates an oblique view of the right atrium and shows some crucial structures. The isthmus of tissue responsible for atrial flutter is seen anterior to the coronary sinus (CS) orifice. The eustachian ridge is part of the crista terminalis that separates the roughened part of the right atrium from the smooth septal part of the right atrium. IVC = inferior vena cava; SVC = superior vena cava. Less common symptoms include angina, profound dyspnea, or syncope. 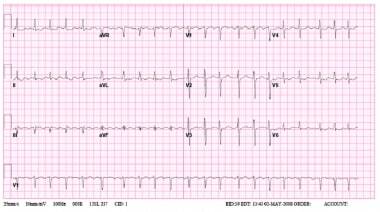 Tachycardia may or may not be present, depending on the degree of AV block associated with the atrial flutter activity. Transthoracic echocardiography (TTE) is the preferred initial imaging modality for evaluating atrial flutter. It can evaluate right and left atrial size, as well as the size and function of the right and left ventricles, and this information facilitates diagnosis of valvular heart disease, left ventricular hypertrophy (LVH), and pericardial disease. Atrial flutter is a cardiac arrhythmia characterized by atrial rates of 240-400 beats/min, usually with some degree of atrioventricular (AV) node conduction block. In the most common form of atrial flutter (typical atrial flutter), electrocardiography (ECG) demonstrates a negative sawtooth pattern in leads II, III, and aVF. Atrial flutter is similar to atrial fibrillation in many respects (eg, underlying disease, predisposing factors, complications, and medical management), and some patients have both atrial flutter and atrial fibrillation. However, the underlying mechanism of atrial flutter makes this arrhythmia amenable to cure with percutaneous catheter-based techniques. In humans, the most common form of atrial flutter (typical) involves a single reentrant circuit with circus activation in the right atrium around the tricuspid valve annulus (most often in a counterclockwise direction), with an area of slow conduction located between the tricuspid valve annulus and the coronary sinus ostium (subeustachian isthmus). 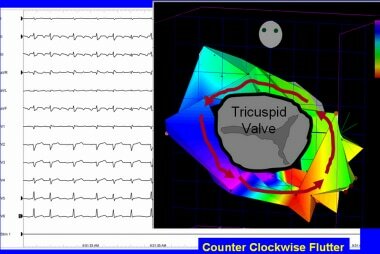 A 3-dimensional electroanatomic map of typical atrial flutter is shown in the video below. 3-Dimensional electroanatomic map of typical atrial flutter. Colors progress from blue to red to white and represent the relative conduction time in the right atrium (early to late). An ablation line (red dots) has been created on the tricuspid ridge extending to the inferior vena cava. This ablation line interrupts the flutter circuit. CSO = coronary sinus os; IVC = inferior vena cava; RAA = right atrial appendage; TV = tricuspid valve annulus. Animal models have been used to demonstrate that an anatomic block (surgically created) or a functional block of conduction between the superior vena cava and the inferior vena cava, similar to the crista terminalis in the human right atrium, is key to initiating and maintaining the arrhythmia. The crista terminalis acts as another anatomic conduction barrier, similar to the line of conduction block between the two venae cavae required in the animal model. The orifices of both venae cavae, the eustachian ridge, the coronary sinus orifice, and the tricuspid annulus complete the barrier for the reentry circuit (see the image below). Typical atrial flutter is often referred to as isthmus-dependent flutter. The rhythm is due to macroreentry, there is an excitable gap, and the rhythm can be entrained. Typical counterclockwise atrial flutter has caudocranial activation (ie, activation counterclockwise around the tricuspid valve annulus when viewed in the left antero-oblique fluoroscopic view) of the atrial septum (see the image below). Typical counterclockwise atrial flutter. This 3-dimensional electroanatomic map of a tricuspid valve and right atrium shows the activation pattern displayed in color format. Red is early and blue is late, relative to a fixed point in time. Activation travels in counterclockwise direction. Typical atrial flutter can also have the opposite activation sequence (ie, clockwise activation around the tricuspid valve annulus). Clockwise atrial flutter is much less common. When the electric activity moves in a clockwise direction, the electrocardiogram (ECG) will show positive flutter waves in leads II, III, and aVF, and they may appear somewhat sinusoidal. This arrhythmia is still considered typical, isthmus-dependent flutter; it is usually called reverse typical atrial flutter. Atypical atrial flutters are less extensively studied and electroanatomically characterized. Atypical atrial flutters may originate from the right atrium, as a result of surgical scars (ie, incisional reentry), or from the left atrium, specifically the pulmonary veins (ie, focal reentry) or mitral annulus (see the image below). Left atrial flutter is common after incomplete left atrial linear ablation procedures (for atrial fibrillation). Thus, tricuspid isthmus dependency is not a prerequisite for atypical atrial flutter. Electrocardiogram of atypical left atrial flutter. Atrial flutter is associated with a variety of cardiac disorders. In most studies, approximately 30% of patients with atrial flutter have coronary artery disease, 30% have hypertensive heart disease, and 30% have no underlying cardiac disease. Rheumatic heart disease, congenital heart disease, pericarditis, and cardiomyopathy may also lead to atrial flutter. Rarely, mitral valve prolapse or acute myocardial infarction has been associated with atrial flutter. Atrial flutter may be a sequela of open heart surgery. After cardiac surgery, atrial flutter may be reentrant as a result of natural barriers, atrial incisions, and scar. Some patients develop atypical left atrial flutter after pulmonary vein isolation for atrial fibrillation. The PITX2 (paired-like homeodomain 2) gene on chromosome locus 4q25 is known to play a major role in left-right asymmetry of the heart and has been found to have a strong association with atrial fibrillation  and an even stronger association with typical atrial flutter. There are not yet any clinically available genetic tests that can identify persons at increased risk for atrial flutter. In a study of 100 patients with atrial flutter, 75% were men. In another study performed at a tertiary care study, atrial flutter was 2.5 times more common in men. Because of the conduction properties of the atrioventricular (AV) node, many people with atrial flutter will have a faster ventricular response than those with atrial fibrillation. The heart rate is often more difficult to control with atrial flutter than with atrial fibrillation, because of increased concealed conduction in those with atrial fibrillation. For the most part, morbidity and mortality result from complications of rate (eg, syncope and congestive heart failure [CHF]). In patients with atrial flutter, the risk of embolic occurrences approaches that seen in atrial fibrillation. Patients with Wolff-Parkinson-White syndrome who develop atrial flutter can develop life-threatening ventricular responses and therefore should be considered for catheter ablation of their accessory bypass tract. Data from the Framingham study suggest that patients with atrial fibrillation do not live as long as patients without atrial fibrillation (ie, control subjects). No data are available on atrial flutter. The prognosis for patients with typical atrial flutter who undergo catheter ablation is excellent, with a very low recurrence rate. The picture is not as clear for patients with both atrial flutter and atrial fibrillation. Some reports have documented fewer episodes of atrial fibrillation after successful flutter ablation; others have not. It is possible that atrial fibrillation may be more responsive to antiarrhythmic agents after atrial flutter has been eliminated. Bohnen et al performed a prospective study to assess the incidence and predictors of major complications from contemporary catheter ablation procedures. Major complication rates ranged from 0.8% (supraventricular tachycardia) to 6% (ventricular tachycardia associated with structural heart disease), depending on the ablation procedure performed. Renal insufficiency was the only independent predictor of a major complication. Patients with concurrently diagnosed new rapid atrial fibrillation or atrial flutter and new reduced left ventricular ejection fraction (LVEF) appear to have a high rate prevalence of left atrial appendage thrombi (LAAT). However, the presence of LAAT does not appear to be prognostic for eventual improvement. Educating patients regarding medications and diet is important. Patients taking warfarin should avoid making major changes in their diet until they have consulted with their healthcare providers. Specifically, a sudden change in the consumption of green leafy vegetables, which are sources of vitamin K, can affect coagulation in patients taking warfarin, which inhibits vitamin K synthesis. This education is not needed with newer drugs that avoid these drug-drug or drug-food interactions. For patient education information, see the Heart Health Center, as well as Atrial Flutter, Arrhythmias (Heart Rhythm Disorders), Stroke, Supraventricular Tachycardia (SVT, PSVT), and Palpitations. Suda K, Matsumura M, Hayashi Y. Myotonic dystrophy presenting as atrial flutter in childhood. Cardiol Young. 2004 Feb. 14 (1):89-92. [Medline]. Ioannidis JP. Prediction of cardiovascular disease outcomes and established cardiovascular risk factors by genome-wide association markers. Circ Cardiovasc Genet. 2009 Feb. 2 (1):7-15. [Medline]. Olesen MS, Holst AG, Jabbari J, et al. Genetic loci on chromosomes 4q25, 7p31, and 12p12 are associated with onset of lone atrial fibrillation before the age of 40 years. Can J Cardiol. 2012 Mar-Apr. 28 (2):191-5. [Medline]. Gudbjartsson DF, Arnar DO, Helgadottir A, et al. Variants conferring risk of atrial fibrillation on chromosome 4q25. Nature. 2007 Jul 19. 448 (7151):353-7. [Medline]. Granada J, Uribe W, Chyou PH, et al. Incidence and predictors of atrial flutter in the general population. J Am Coll Cardiol. 2000 Dec. 36 (7):2242-6. [Medline]. Ghali WA, Wasil BI, Brant R, Exner DV, Cornuz J. Atrial flutter and the risk of thromboembolism: a systematic review and meta-analysis. Am J Med. 2005 Feb. 118 (2):101-7. [Medline]. Bohnen M, Stevenson WG, Tedrow UB, et al. Incidence and predictors of major complications from contemporary catheter ablation to treat cardiac arrhythmias. Heart Rhythm. 2011 Nov. 8 (11):1661-6. [Medline]. Biblo LA, Yuan Z, Quan KJ, Mackall JA, Rimm AA. Risk of stroke in patients with atrial flutter. Am J Cardiol. 2001 Feb 1. 87 (3):346-9, A9. [Medline]. Stiell IG, Clement CM, Rowe BH, et al. Outcomes for emergency department patients with recent-onset atrial fibrillation and flutter treated in Canadian hospitals. Ann Emerg Med. 2017 May. 69 (5):562-71.e2. [Medline]. Rodriguez Y, Althouse AD, Adelstein EC, et al. Characteristics and outcomes of concurrently diagnosed new rapid atrial fibrillation or flutter and new reduced ejection fraction. Pacing Clin Electrophysiol. 2016 Dec. 39 (12):1394-403. [Medline]. Saoudi N, Cosio F, Waldo A, et al. Classification of atrial flutter and regular atrial tachycardia according to electrophysiologic mechanism and anatomic bases: a statement from a joint expert group from the Working Group of Arrhythmias of the European Society of Cardiology and the North American Society of Pacing and Electrophysiology. J Cardiovasc Electrophysiol. 2001 Jul. 12 (7):852-66. [Medline]. [Guideline] Page RL, Joglar JA, Caldwell MA, et al, and the Evidence Review Committee Chair‡. 2015 ACC/AHA/HRS guideline for the management of adult patients with supraventricular tachycardia: executive summary: a report of the American College of Cardiology/American Heart Association Task Force on Clinical Practice Guidelines and the Heart Rhythm Society. Circulation. 2016 Apr 5. 133 (14):e471-505. [Medline]. [Full Text]. Risius T, Mortensen K, Schwemer TF, et al. Comparison of antero-lateral versus antero-posterior electrode position for biphasic external cardioversion of atrial flutter. Am J Cardiol. 2009 Dec 1. 104 (11):1547-50. [Medline]. Falk RH, Pollak A, Singh SN, Friedrich T. Intravenous dofetilide, a class III antiarrhythmic agent, for the termination of sustained atrial fibrillation or flutter. Intravenous Dofetilide Investigators. J Am Coll Cardiol. 1997 Feb. 29 (2):385-90. [Medline]. Abi-Mansour P, Carberry PA, McCowan RJ, Henthorn RW, Dunn GH, Perry KT. Conversion efficacy and safety of repeated doses of ibutilide in patients with atrial flutter and atrial fibrillation. Study Investigators. Am Heart J. 1998 Oct. 136 (4 pt 1):632-42. [Medline]. Stambler BS, Wood MA, Ellenbogen KA, Perry KT, Wakefield LK, VanderLugt JT. Efficacy and safety of repeated intravenous doses of ibutilide for rapid conversion of atrial flutter or fibrillation. Ibutilide Repeat Dose Study Investigators. Circulation. 1996 Oct 1. 94 (7):1613-21. [Medline]. Stambler BS, Wood MA, Ellenbogen KA. Antiarrhythmic actions of intravenous ibutilide compared with procainamide during human atrial flutter and fibrillation: electrophysiological determinants of enhanced conversion efficacy. Circulation. 1997 Dec 16. 96 (12):4298-306. [Medline]. Vos MA, Golitsyn SR, Stangl K, et al. Superiority of ibutilide (a new class III agent) over DL-sotalol in converting atrial flutter and atrial fibrillation. The Ibutilide/Sotalol Comparator Study Group. Heart. 1998 Jun. 79 (6):568-75. [Medline]. [Full Text]. Alboni P, Botto GL, Baldi N, et al. Outpatient treatment of recent-onset atrial fibrillation with the "pill-in-the-pocket" approach. N Engl J Med. 2004 Dec 2. 351 (23):2384-91. [Medline]. [Guideline] You JJ, Singer DE, Howard PA, et al. Antithrombotic therapy for atrial fibrillation: antithrombotic therapy and prevention of thrombosis, 9th ed: American College of Chest Physicians evidence-based clinical practice guidelines. Chest. 2012 Feb. 141 (2 suppl):e531S-e575S. [Medline]. [Full Text]. Berger M, Schweitzer P. Timing of thromboembolic events after electrical cardioversion of atrial fibrillation or flutter: a retrospective analysis. Am J Cardiol. 1998 Dec 15. 82 (12):1545-7, A8. [Medline]. Grimm RA, Stewart WJ, Arheart K, Thomas JD, Klein AL. Left atrial appendage "stunning" after electrical cardioversion of atrial flutter: an attenuated response compared with atrial fibrillation as the mechanism for lower susceptibility to thromboembolic events. J Am Coll Cardiol. 1997 Mar 1. 29 (3):582-9. [Medline]. Welch PJ, Afridi I, Joglar JA, et al. Effect of radiofrequency ablation on atrial mechanical function in patients with atrial flutter. Am J Cardiol. 1999 Aug 15. 84 (4):420-5. [Medline]. Bertaglia E, Zoppo F, Bonso A, et al, for theNortheastern Italian Study on Atrial Flutter Ablation Investigators. Long term follow up of radiofrequency catheter ablation of atrial flutter: clinical course and predictors of atrial fibrillation occurrence. Heart. 2004 Jan. 90 (1):59-63. [Medline]. [Full Text]. Bazan V, Grau N, Valles E, et al. Obstructive sleep apnea in patients with typical atrial flutter: prevalence and impact on arrhythmia control outcome. Chest. 2013 May. 143 (5):1277-83. [Medline]. Saygi S, Drca N, Insulander P, Schwieler J, Jensen-Urstad M, Bastani H. Myocardial injury during radiofrequency and cryoablation of typical atrial flutter. J Interv Card Electrophysiol. 2016 Aug. 46 (2):177-81. [Medline]. Saygi S, Bastani H, Drca N, et al. Impact of cavotricuspid isthmus morphology in CRYO versus radiofrequency ablation of typical atrial flutter. Scand Cardiovasc J. 2017 Apr. 51 (2):69-73. [Medline]. Winkle RA, Moskovitz R, Mead RH, et al. Ablation of atypical atrial flutters using ultra high density-activation sequence mapping. J Interv Card Electrophysiol. 2017 Mar. 48 (2):177-84. [Medline]. Rehm J, Roerecke M. Cardiovascular effects of alcohol consumption. Trends Cardiovasc Med. 2017 Nov. 27 (8):534-8. [Medline]. Coffey JO, d'Avila A, Dukkipati S, et al. Catheter ablation of scar-related atypical atrial flutter. Europace. 2013 Mar. 15 (3):414-9. [Medline]. Lin JH, Kean AC, Cordes TM. The risk of thromboembolic complications in Fontan patients with atrial flutter/fibrillation treated with electrical cardioversion. Pediatr Cardiol. 2016 Oct. 37 (7):1351-60. [Medline]. Glover BM, Chen J, Hong KL, et al. Catheter ablation for atrial flutter: a survey by the European Heart Rhythm Association and Canadian Heart Rhythm Society. Europace. 2016 Dec. 18 (12):1880-5. [Medline]. Gould PA, Booth C, Dauber K, Ng K, Claughton A, Kaye GC. Characteristics of cavotricuspid isthmus ablation for atrial flutter guided by novel parameters using a contact force catheter. J Cardiovasc Electrophysiol. 2016 Dec. 27 (12):1429-36. [Medline]. A 12-Lead electrocardiogram of typical atrial flutter. Note the negative sawtooth pattern of the flutter waves in leads II, III, and aVF. Rhythm strips demonstrating typical atrial flutter unmasked by adenosine (Adenocard).